Sales of professional PTZ cameras are to grow by 37% over the next three years to 2021 finds Futuresource Consulting, as companies from across the broadcast, pro video and AV spectrum look for alternative, cost-effective ways to produce video. Non-traditional camera vendors like NewTek and Ross Video now have PTZ camera lines. As budgets tighten, more and more broadcasters are looking for an all-in-one option. PTZs deliver on the need for high quality visuals and integrate extremely well into automated environments where shots and looks can be reproduced daily. The Broadcast Bridge analyses the rise of the PTZ. There are multiple reasons for the recent rise in demand for PTZ cameras in broadcast and entertainment. While we are still beholden to the lens that the camera comes with, sensors themselves have advanced to the point where colour can be manipulated and cameras can be shaded with the same technology as used in traditional broadcast cameras. Three chip PTZs offer many of the same features as broadcast cameras, with a lower price point and robotic movement built in, and this creates the opportunity for a lower cost studio production. Bryce Button, Director of Product Marketing, AJA Video Systems suggests demand can be attributed in part to a desire among broadcasters and entertainment venues to improve the audience experience. Arguably the primary reason for ascendancy of demand for PTZ cameras in all production spaces is the need to do more with less. Video technology has advanced to the point where relatively affordable PTZ cameras can deliver ‘close enough’ and even equivalent results compared to considerably more expensive studio and ENG cameras. When you add that overall cost-effectiveness with the flexibility of installation, and the ability to automate and remotely control the PTZ cameras, the benefits multiply. “You can add more cameras in more places and get more creative with your content, without having to account for a dedicated operator for every camera in your budget or logistics,” says Jason Pruett, NewTek’s product marketing manager. Rushworks Models 1 and 2. In general, the cameras are less expensive, smaller, lighter, quieter, and have longer zoom lenses. With the ability of many to support PoE and/or NDI, remote controllability of these high quality cameras makes them suitable and appropriate for virtually any production venue. PTZ cameras can also facilitate UHD (4K), Full HD and SD, all via IP. From fixed-rig TV productions, to live streaming and corporate use in auditoriums, PTZ remote cameras support the most difficult of shooting conditions in both indoor and outdoor situations. “Since PTZ cameras were first brought out, they have developed a lot, making them more suited to live events and streaming,” says Oliver Newland, UK Marketing Manager, Panasonic ProAV. He cites Panasonic’s new 4K integrated remote camera AW-UE150, which offers 4K 60p capture – a first for a broadcast-class PTZ. “It’s this next generation of PTZ camera with a step-up in resolution, lensing and interfacing presents a clear 4K upgrade path and a new generation of workflow for such premium PTZ applications as high-end enterprise, broadcast and productions applications,” he says. The use of remote cameras has become increasingly popular in recent years and have changed our televisual tastes over the last decade. Great examples of this are the 24 hours in and the Educating series on Channel 4 which is almost entirely shot on remote PTZ cameras. The BAFTA Award winning series offers a window into a modern British secondary school, following teachers and students to give a full perspective of school life today. The cameras are programmed and operated by Roll to Record for production company Twofour. The growth in popularity of the big reality productions, shows no sign of abating. In the UK, shows such as First Dates, produced by Twenty Twenty, makes use of Panasonic PTZs. While Garden Productions deploys PTZ kit in both 24 Hours in Police Custody and 24 Hours in A&E. The UK’s summer hit of 2017 and 2018, ITV Studios’ Love Island, uses up to 70 Panasonic PTZ cameras. OB company NEP integrated the cameras for use both within the villa and in the grounds outside, hidden behind mirrors and concealed in a number of different ways to capture the most true-to-life material possible from the contestants. Rental house and specialist camera maker Camera Corps’ experience of reality shows with heavy usage of remotely controlled PTZ (Focus) includes Fame Academy and The Match each using more than 20 cameras all controlled from a dual operating position (two camera operators could control any of the cameras). The operating position was situated in the production gallery with vision control via a separate panel in the engineering area. Starting in 2008 on ITV’s hugely popular reality show I’m a Celebrity Get Me Out of Here Camera Corps supplied over 40 cameras for 'the jungle' set in Australia all controlled from a production gallery 700 metres distant. Automation has allowed studios to be controlled by a single operator, or no operator at all. A sequence of shots can be activated by the click of a mouse. Panasonic has built up a number of collaborations with industry partners such as Tecnopoint and Movicom, to create robotic systems, new protocols and tracking systems making this level of integration easier. A number of facilities create one central control station for camera operation. For instance, using AJA RovoControl software, one person can control multiple RovoCams through an easy to operate GUI on a single PC. PTZ camera automation can take a number of different forms in the context of a broadcast production workflow. It can be as easy as configuring simple presets that an operator can use to adjust settings automatically or maneuver a PTZ into position for shot without having to manually control the movement. An experienced operator may hold the responsibility of controlling multiple PTZ cameras simultaneously—often from a single controller. Some PTZ automation doesn’t require interaction from an operator at all, as camera commands can be attached to macros that respond to real-time production system operations. In terms of PTZ camera advancements, AJA is seeing higher quality optics, simpler control and cabling via innovations like HDBaseT alongside a continued shift to IP. NewTek points to the wave of manufacturers like itself and Panasonic, Lumens, Marshall, and PTZ Optics integrating the NDI protocol into PTZ cameras for direct input over the network into IP video workflows. “Combine this with the integration of POE+ technology facilitating single-cable connectivity for video, audio, power, and control, and PTZ cameras make for a very compelling solution for cost-conscious broadcasters at every level who are increasingly turning to network infrastructure for their video operations,” says Pruett. Broadcasters and production companies are constantly exploring new ways to maintain quality and increase productivity while reducing operating costs, and that process is especially critical today as viewers seemingly can’t get enough content. Moving towards remote operation and automated production is helping them meet those demands—and PTZ cameras are a key enabling technology. They are relatively affordable, and offer the professional quality, flexibility, and convenience needed to do more with often much less. Ross Video’s principal product is the PIVOTCam line of PTZs. The entry level PIVOTCam-20 offers serial control, 20x zoom, and excellent visuals in low light. It just introduced PIVOTCam-SE which adds IP control, power over Ethernet, Gen Lock input, and 4K streaming. The optical stability of the unit has been enhanced with the addition of a second arm, ensuring a clean and stable image, even on the tightest shots provided by the 23X optical zoom. AJA’s RovoCam ($2550) offers a Sony UltraHD sensor that gives users the ability to extract an HD raster from source and even explore ePTZ pans and tilts from a stationary camera as you scan the original UltraHD raster. 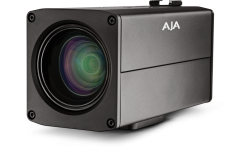 Paired with free RovoControl software for macOS, Windows and Linux, AJA’s RovoCam supports ePTZ for moving an HD 1080p box around an UltraHD frame, allowing pan and tilt for HD output. 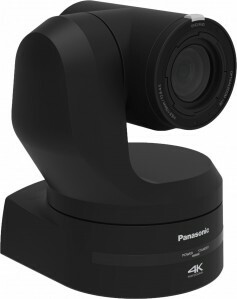 Panasonic claims the industry first 4K 50p, HDR integrated PTZ camera. The AW-UE150 includes 4K interfaces 12G-SDI, HDMI, Optical Fibre and IP which supports HDR mode. In addition, the €11,000 camera can simultaneously output both 4K and Full HD. It’s the new flagship for Pana’s PTZ range and is the first in its class to feature 4K 50p and a wide viewing angle of 75.1 degrees horizontally along with 20x optical zoom and 32x intelligent zoom (in HD mode). The camera allows up to three Full HD crops from the single 4K image canvas. This offers greater flexibility and, alongside its compact size, makes it ideal for more challenging camera locations. A remote control unit priced €4,500 offers a large LCD screen for monitoring and menu settings. Rushworks offers several alternatives for PTZ production control. 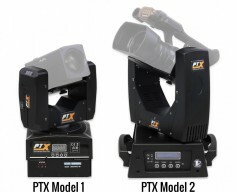 The PTX Universal PanTilt heads provides a pan and tilt base with VISCA or DMX control. 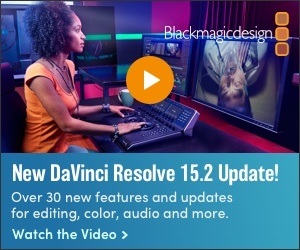 The Model 1 supports smaller cameras like the Blackmagic Micro Studio Camera 4K, AJA RovoCam, and Canon XA-35. The Model 2 supports larger cameras like the URSA Mini, RED, ARRI, and a number of DSLR offerings. Its 3n1 PTZ features an HD-SDI camera with 20x optical zoom, a second HD-SDI built-in camera with fixed wide lens, and the ability to track a subject in motion. The smaller, single camera option has the same optics and lens, but with a 6” x 6” footprint. Mobile Viewpoint has two new products, NewsPilot and IQ Sports Producer each using Artificial Intelligence and either PTZs or fixed lens to automate the low-cost delivery of content from remote locations. NewsPilot can be used in studio environments or in the field to automate news production without the need for camera crew or a director. For example, smaller broadcasters or independent reporters and producers could use NewsPilot for live field news and event reporting, or in-studio news and interview production. It consists of three PTZ cameras and the firm’s Automated Studio control box. It also includes CameraLink, a robotic arm which can move a 3kg PTZ camera much like a traditional dolly arrangement, offering the same camera control normally associated with high quality news productions. The main elements of IQ Sports Producer are a fixed-position 24MP 180° camera that can cover an entire field of play, a dedicated appliance with Mobile Viewpoint’s AI engine and IQ Sport Producer Software, and connection to the LinkMatrix management dashboard. The AI selects which of the camera’s four 6MP lenses to use given the position of play during a match or game. Originally used in the defence industry to track missiles, the AI evolved first as a means to capture sport training sessions and is now used to track players, balls or other objects during a live match or game. Twenty years ago very few systems were available with the integrated camera and zoom lens offered in the Camera Corps’ Q-Ball. They required a lot of additional equipment to make them work. Control systems that work over IP have also made an impact on these installations as data routing is now an off-the-shelf product. According to Camera Corps, a key strength of the Q-Ball series is its very smooth pan and tilt mechanism, including high-precision acceleration and deceleration. These features are especially useful in live environments because they allow accurate on-air follow shoots. It says its clients in the television news sector are also making increased use of PTZ and PTZF cameras because these allow fast setup and provide greatly extended shooting options. The NewTek NDI PTZ Camera was the first camera on the market to natively support NDI for direct IP workflow integration. Since then, other manufacturers have moved forward with integrating native NDI support into their PTZ cameras, including Panasonic, Lumens, Marshall, and PTZ Optics, with more expected to be announced in the future. “The quality of the NewTek PTZ cameras is great in terms of picture image, there are a lot of controls internally to allow you to get the best out of each situation. Like most PTZ, they can initially suffer from focus drift in poor light conditions, but again, planning out your shots in advance and locking of focus can resolve this,” says Mike Barker, IET.tv Production Manager. IET.tv uses NewTek’s PTZ cameras to film technical conference content for the Institution of Engineering and Technology, either as a standalone camera or to compliment a manned camera. BirdDog claims the world’s first PTZ Controller for its range of NDI-enabled PTZ cameras. The models P100, P200, A200 and A300 all feature BirdDog’s custom silicon NDI chip offering 16ms latency and a Sony CMOS backlit sensor. 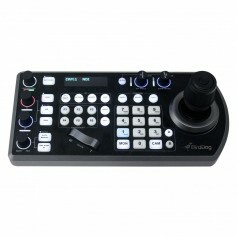 The PTZ Keyboard features NDI and NDI | HX support and is the only controller with audio intercom support over NDI. The Keyboard allows users to discover, connect and control the full range of NDI enabled cameras. The models are capable of withstanding extreme operating temperatures between -40°C to +60°C, and even feature a rain wiper to keep water off the lens in wet outdoor locations. Texas A&M’s Reed Arena features five AJA RovoCam UltraHD/HD HDBaseT cameras installed throughout the space that give basketball fans a fresh perspective of each game. The compact block cameras capture in-stadium footage of athletes and fans, which is displayed on a 54’ x 24’ video board, one of the largest among NCAA Division 1 schools. Strategically located under the tip-off, under the video board, on top of each basket, and on top of the production booth in Reed Arena, the cameras capture 1080 HD video from UltraHD sensors, and are mounted to PTZ heads, except one of the centrally mounted cameras. Each live feed is sent to a PC running VISCA-based command control software in the production booth, where a team member controls the camera moves. Zoom controls are used for close-ups on players and the crowds, with iris controls used to adjust light for shots with shadows. 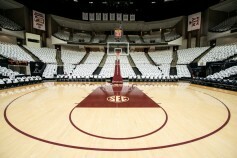 RovoCam in situ at Reed Arena.